Give your beautiful breasts a spa treatment. 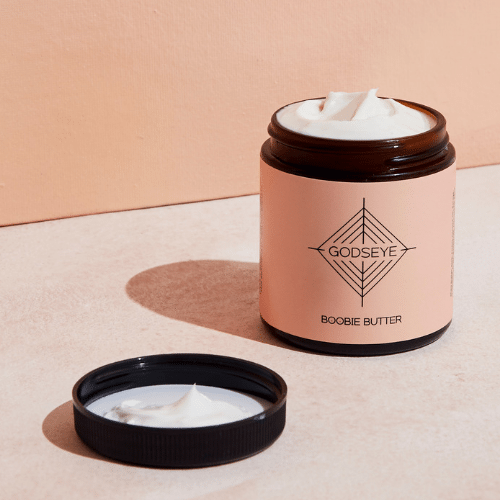 Boobie Butter is decadent silk for your skin. This formula is built around wild crafted, fair trade Ghana Shea Butter. This cold processed nut butter is an anti aging treatment for your bosom. 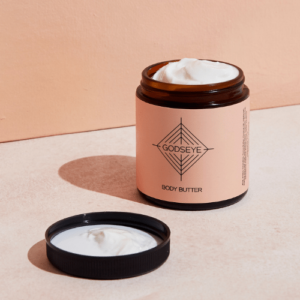 This butter was also created with the intention that women check their breast health often. BOOBIE BUTTER is made from deep love. I keep a jar next to my bed and slather it on before I sleep. It has really helped me in my self-care ritual. My heart soaks up the softness it needs, the scent lifts my awareness and lifts my boobies! No joke, like Perky McPerkins people! This luxurious stuff works. Get you some. LOVE my boobie butter!! It’s has the silkiest, smooth consistency! The earthy smell has such a calming effect on me. I rub it on my hands at night which helps me sleep. Most importantly, It’s gotten me into a daily ritual of massaging my breasts which is a major line of defense in detecting any irregularities. Get to know your boobies girls!! I highly encourage you to love yourself with this luxurious butter made by an angel!! This succulent lotion feels SO good on my boobies and I love the benefits even more. The delicate scent is calming as I massage this lotion on my girlies. I also appreciate the ritual created by owning this boobie butter, you WANT to make the time to rub this on and get to know your lovely lady parts! I used this on my bump during my pregnancy and I didn’t get a single stretch mark. It made my skin feel super hydrated and smooth, and smells heavenly (but not overpowering). Definitely recommending to all lady friends!